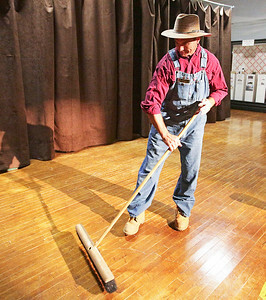 John Konstantaras - For Shaw Media Woodstock Chief of Police John Lieb plays a school janitor in "Elementary Follies" at the McHenry County Historical Society on Wednesday, July 27, 2016 in Union, IL. The play is a fundraiser for the 1867 Pringle one room school to be held on August 12 & 14 in Union. 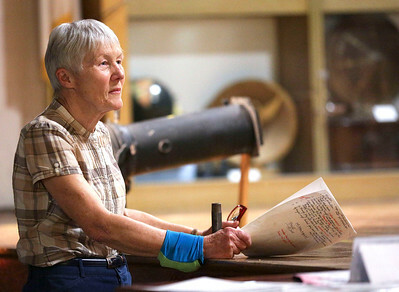 John Konstantaras - For Shaw Media "Elementary Follies" director Nancy Fike, of McHenry, watches the dress rehearsal Wednesday, July 27, 2016 at the McHenry County Historical Society production on in Union, IL. The play with performances on August 12 & 14 in Union is a fundraiser for the 1867 Pringle one room school. 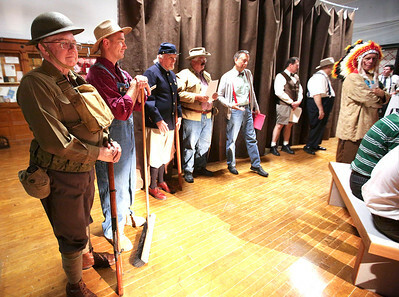 John Konstantaras - For Shaw Media Ed O'Brien, of Harvard, stands with cast members as they wait to take a group photo before a dress rehearsal for "Elementary Follies" at the McHenry County Historical Society on Wednesday, July 27, 2016 in Union, IL. The play is a fundraiser for the 1867 Pringle one room school to be held on August 12 & 14 in Union. 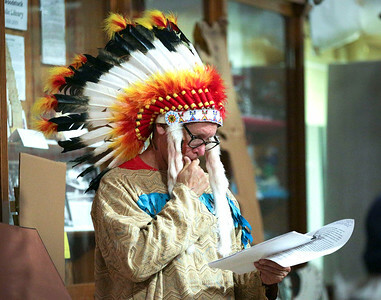 John Konstantaras - For Shaw Media Dressed as an indian, John Green, of Cary, reads over his script Wednesday, July 27, 2016 during a dress rehearsal for "Elementary Follies" at the McHenry County Historical Society in Union, IL. 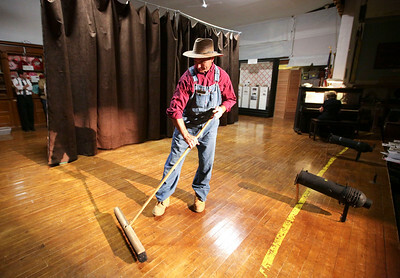 The performances will be held on August 12 and 14 in Union as a fundraiser to benefit the 1867 Pringle one room school. 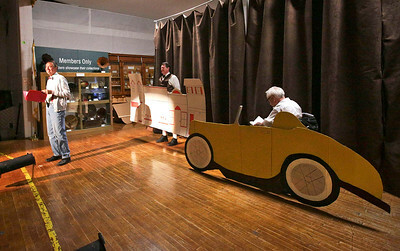 John Konstantaras - For Shaw Media Herb Franks, of Marengo, during the dress rehearsal Wednesday, July 27, 2016 during a dress rehearsal for "Elementary Follies" at the McHenry County Historical Society in Union. 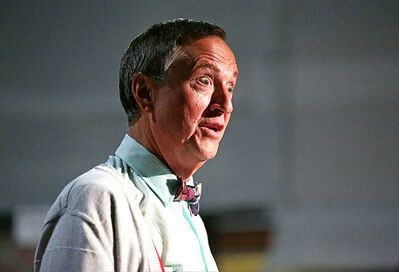 The performances will be held on August 12 and 14 in Union as a fundraiser to benefit the 1867 Pringle one room school. 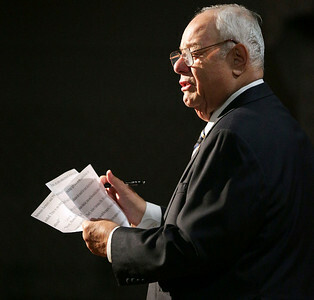 John Konstantaras - For Shaw Media Former McHenry mayor William Busse performs Wednesday, July 27, 2016 during a dress rehearsal for "Elementary Follies" at the McHenry County Historical Society on in Union, IL. The play is a fundraiser for the 1867 Pringle one room school to be held on August 12 & 14 in Union. 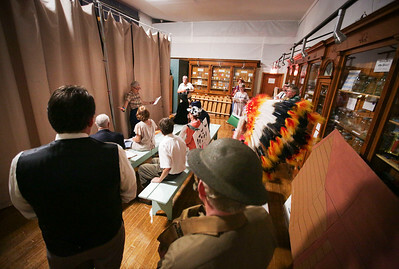 John Konstantaras - For Shaw Media Former McHenry mayor William Busse (left) narrates Act III during the dress rehearsal for "Elementary Follies" at the McHenry County Historical Society on Wednesday, July 27, 2016 in Union, IL. The play is a fundraiser for the 1867 Pringle one room school to be held on August 12 & 14 in Union. 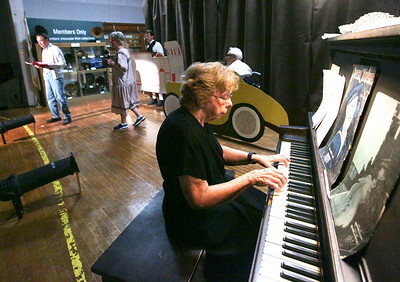 John Konstantaras - For Shaw Media Marie Kingsley plays the piano Wednesday, July 27, 2016 during the dress rehearsal for "Elementary Follies" at the McHenry County Historical Society in Union, IL.